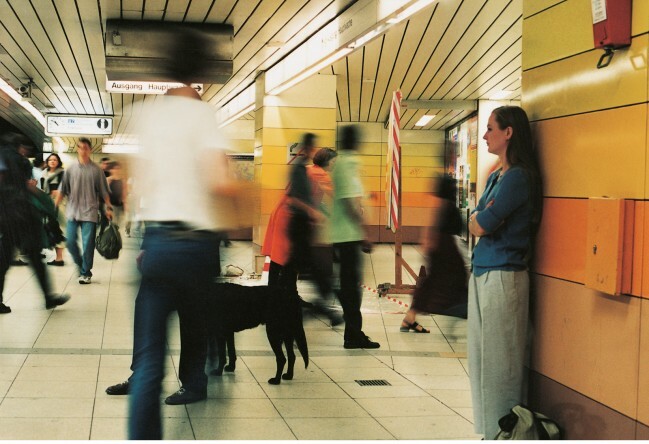 Beitrag zur Ausstellung „To the people of the city of the Euro“ des Frankfurter Kunstvereins war die Aktion Hauptwache: Das Bild „To the people of the city of the … (Hauptwache)“ entstand mit Modellen in der U-Bahnstation Hauptwache in Frankfurt. The contribution to the exhibition „To the people of the city of the Euro“ hosted by Frankfurter Kunstverein was the Hauptwache picture project at the underground station of the same name. The picture "To the people of the city of the … (Hauptwache)“ was painted with models.